The Greater Pacific War Project has been growing for the last few weeks. We have gone from 5 core members to 15. We have garnered industry support as well. It’s been a very exciting time. The project, in summary, is an attempt to re-tell the history of The Greater Pacific War of 1931-1945 with historical miniatures. We have a website that is growing in functionality. I also have been blogging about the project at http://corpcomander.blogspot.com. To give you an idea of the depth of the project the following games are to be run at Historicon 2006. Not all scenario names are finalized but watch the website for further details. The number of Nationalities this represents is very broad. From Indians and Naga to Philippines, Chinese, British, Americans and Japanese we have covered a large percentage of the peoples involved in this theater of World War II. Our eye is on as complete coverage as possible given our ability to run games, figures available and so forth. In some cases we have had to do large amounts of conversions, such as the case with the KMT Chinese. Further support is being offered in the form of volunteer work, advice and moral support from HMGS-Mid South, Lord Al’s Expeditionary (Al Gaiser) and Nancy Tiller. The project is more than just a handful of events at Historicon. The website is a community updated entity that will provide valuable information, scenario ideas and discussion about this engaging piece of history. We hope you enjoy what we can provide and contribute on our forum. With Every Promise of an Unmitigated Disaster! Today was interesting. I kicked off working on the miniatures for the Marco Polo Bridge game. I think it will be a great game. However, this morning things were in doubt. First off, who in their right mind would start a major project and drop hundreds of dollars on figures knowing that no one makes the figures you need for the game? I have a powerful combination of stupidity and unmatched over-confidence. Thankfully, at least this time, it pushed me in the right direction. The Kuomintang 29th Army is an interesting beast. They were trained and equiped by the Germans though their organization reflected the realities of China in the 1930’s. 15 man all rifle squads were not uncommon. Though much of their kit was German, there are differences. The major one is that they don’t have boots. They have puttees. My original plan was to use Finnish and German figures from several sources. 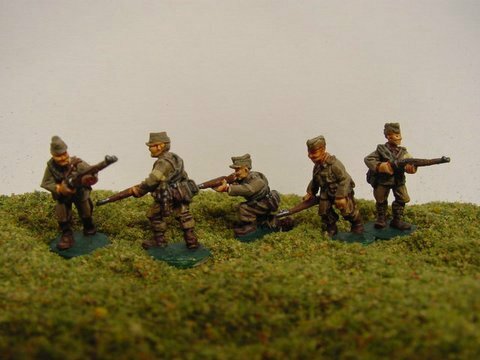 Battle Honors, Bolt Action Miniatures and Artizen make up the majority of them. Then I was going to use thin strips of masking tape or dental floss to make the puttee. Sufice to say as soon as I tried that approach it was clear neither way was going to give acceptable results. In fact it was a total write off. This left me in a dilema. I had spent the day cleaning flash and mold lines and flattening bases for the figures. It struck me that maybe I could make the puttees right on the legs. A little flattening, some carving, what could go wrong? It was an idea that was pregnant with every promise of an unmitigated disaaster! I am really happy with how they came out. Sure, some figures did not look as good as others. some looked Fantastic. The best were the ones that started with a straight, high boot. The worst were the ones with flaring blousing over short boots. In those cases I used a sharp blade and dremel file to smooth them out. All in all, I am very pleased though with the results. I now have very acceptable troops! The main trick is to make about 4-5 lines from the knee down to above the ankle. If there is a boot, make a line above the top of the boot. This helps hide the boot by disguising where it actually ends. Do what you can to smooth the leg and it will look good. Your X-Acto knife needs a heavy blade and needs to be as sharp as possible. You will inadvertently cut off some feet. I did. Just be sure to glue them back and carry on. Out of over 100 figures converted I cut off 3 feet. The figures are expected to live! I’ve glued them back together and I think they will be fine. I want to thank my able assitant today who spent 5 hours helping me get this task done. Alison, our Media Relations person came over to see what this was all about and got pressganged into cleaning flash! It took about 5 hours. 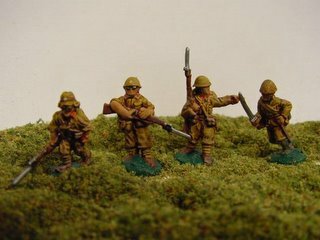 When I get some of the KMT painted I’ll provide photos. Here is the group of us that ran Dien Bien Phu getting our Blue Ribbon. From Left to Right are Peter (Me), Martin, Sam, Pete and James. Martin did the terrain, Pete did the rules and the figures. The rest of us helped GM and drink beer. It was great fun! this event was held at Fall-in 2005 and yes we all wore funny French hats. I am sure they have a name, perhaps a faithful reader will comment on it! The forums are up and working at the GPW site. Contact information has been added as well. Go there, register and get yourself on line! Look at these! The detail is fantastic. Between the great paint job and the great figures this is one nice collection. I don’t think they will ever see the gaming table though; Baxter want to create a display – I suppose it just means more people will get to gawk and stare. I took a lot of pictures for Baxter tonight for several nationalities in his 20mm World War Two line. The figures are very detailed and the paint job by David Crenshaw is amazing! Here is a discussion about the battle of Slim River. TMP member Oddball is looking for information about the forces involved in the battle. If you know anything jump in on the discussion or leave comments here. Thanks!